Every year, millions of Americans make difficult decisions about their jobs when facing some of life’s most challenging moments and significant events. However, many working people — and especially those who identify as LGBTQ — face significant barriers when needing to take time off to care for themselves or for loved ones. For the estimated 1.8 million LGBTQ people of color in the American workforce, existing forms of discrimination can further limit access to paid parental, family care and medical leave. HRC Foundation released the U.S. LGBTQ Paid Leave Survey report, featuring the responses of 5,433 LGBTQ people representing all 50 states, varying ages, and a variety of sectors. 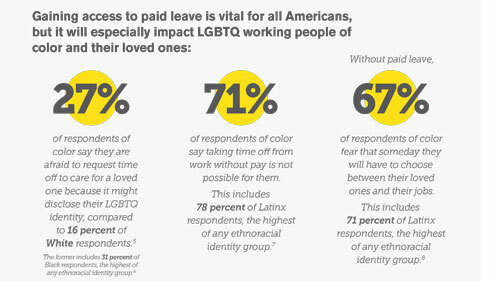 This report briefly explores the survey responses of 1,883 LGBTQ respondents of color, including their experiences requesting and taking paid and unpaid leave.